Custom-Made Crowns in Just One Visit! Our practice works hard to provide its patients the most advanced dental technology possible. As part of staying on the cutting-edge, we want to ensure that your next dental care experience is convenient without sacrificing quality. With the help of breakthrough technology like CEREC, Dr. Hornstein can create custom-made restorations, get them placed faster, and do so entirely in the office! Technology that is focused on saving patients time, money and headache is always worth getting excited for. To get your next CEREC crown, contact our office to schedule an appointment! 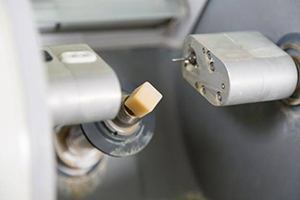 CEREC stands for Chairside Economical Restoration of Esthetic Ceramics and is a unique dental technology designed for fabricating dental restorations. While CEREC technology has been around for a long time, only some dentists are starting to introduce it to their office. Dr. Hornstein and his team hopes that including it in our practice will make your visit all the more convenient, especially if you do not typically have time to get to our office. Once the we have removed all decay, we can easily design and fabricate a new crown to restore your damaged tooth. Since the crown is fabricated entirely in the office, we do not need to go through the process of recapturing and recreating your crown if it does not fit just right. Making adjustments to your restoration is a simpler and more accessible process. Because it uses CAD/CAM, or computer-aided design/computer-aided manufacturing technology, our office can customize every aspect of your restoration and make easy adjustments on-the-fly. CEREC uses a computer, camera and milling machine all-in-one to create your restorations, whether they be dental fillings or crowns. 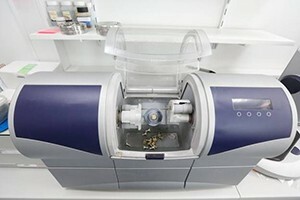 The machine uses a small handheld camera to capture an optical impression of your tooth, then send that data back to the computer. Next, CEREC’s program displays this data via an image on a nearby display so Dr. Hornstein can make fine-tune adjustments to the crown. After completing the design, he will start the machine and allow the CAM system to do the rest. After the crown is completed, he will bond the crown to your damaged tooth and you can be on your way! One of the main benefits of CEREC is you do not have to wait the typical two weeks to receive your restoration like you would for a traditional crown. CEREC crowns also allow for more personal customization, instead of solely relying on a third-party to create it. If a crown is fabricated incorrectly, redoing the crown is much easier and you are more likely to get a crown that fits your tooth exactly right. We hope that you will enjoy the convenience of CEREC. Please call our office today to arrange your next appointment with Dr. Hornstein and experience the difference CEREC-made crowns have to offer! How Long Can a CEREC Same-Day Crown Last? CEREC crowns are as durable as traditionally-made crowns, so they should last for a very long time without much issue. Of course, like traditional crowns, CEREC versions are not indestructible and should be cared for in the same way as traditional crowns. With proper care, it’s typical for a CEREC crown to last at least a decade. In many cases, these crowns last even longer than ten years. Since the entire milling process is done in our office, you don’t have to wait for a dental lab to create your permanent crown. CEREC crowns are truly same-day, which means the same day that you need a crown, you get one. This is a permanent crown, not a temporary crown designed to last less than two weeks. The creation of your CEREC crown takes about one hour to complete. All CEREC crowns are made from 100 percent dental ceramic. These metal-free restorations are not only designed to look like natural teeth, but blend in with your current smile. CEREC crowns are color-matched to your original teeth ensuring that they look natural and beautiful. Keep in mind that just because they look natural doesn’t mean they aren’t also incredibly durable. Does a CEREC Dental Crown Provide a Natural Appearance? Dental crowns are intended to solve a multitude of issues with teeth. This includes sealing bacteria away from your damaged tooth as well as making your smile look as natural as possible. Part of this is making sure the shade of your crown matches your existing teeth. However, the crown also needs to follow the natural contours of your other teeth. This prevents your crown from standing out from your smile and keeps your bite even. What Steps Should I Take to Care for a CEREC Crown? CEREC crowns are strong, but your oral hygiene and daily habits are directly correlated with how long the restoration will last overall. Our office will make sure that your crown fits securely and feels comfortable. If your crown no longer feels secure for any reason, it is crucial that you come back to our office for adjustments. Avoid drinking hot fluids or consuming foods high in sugar if they increase sensitivity around your crown. Avoid sticky foods that could potentially shift or remove your crown. Get to our office as soon as possible to have your crown reseated if removed. Make sure to brush along the crown and floss underneath it to remove food debris and plaque. To keep the crown as natural-looking as possible, avoid foods, beverages and habits that easily stain teeth. This may include coffee, pasta sauce and tobacco. Visit our office once every six months for exams and cleanings. This will give Dr. Hornstein a chance to examine the current condition of your restoration.